Some people are constantly moving about and pushing themselves to get things done. These people don’t really know how to slow down, and really even taking a moment to pause can be challenging for them. 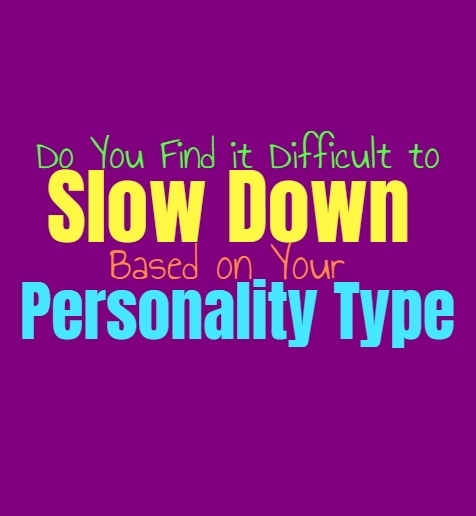 Here is how capable you are of slowing down, based on your personality type. INFJs are capable of taking things slow, especially if they have someone to do this with. They like not having to feel constantly rushed, since they want to think through all of the details and enjoy themselves along the way. INFJs like being able to take things slow sometimes, and just soak all of it in along the way. Having to constantly move fast can be draining for them, since they don’t like feeling as if someone is rushing or pushing them to do things a certain way. INFJs want to be sure of their choices before moving forward, and so sometimes slowing down can be nice. ENFJs can actually struggle to slow down or take things at a less active pace. They can become so focused on getting things done and juggling various tasks, and so it becomes difficult for them to slow down or move at a less chaotic pace. The ENFJs perfectionists nature can sometimes push them to overwork themselves and really struggle to slow down when they should. ENFJs often want to slow down and be capable of relaxing with loved ones, but their minds are often wrapped up in so many different things they need to be doing. INFPs are often capable of slowing down physically, but not always mentally. While they don’t need to constantly be rushing around juggling different activities, their minds are often much more active than people realize. Even when the INFP seems still and as if they have slowed down, they usually have so many thoughts running around inside of their heads. This can make it challenging for them to truly slow down, even though it is something they often want to be able to do. ENFPs are often very active people, constantly wanting to be moving in different directions. Even when the ENFP isn’t physically active, their minds are racing and running in different directions. When the ENFP seems still this is often when there is even more going on inside of their heads. They process so much all at once and can rarely get their own minds to slow down and remain calm the way they might want. For the ENFP slowing down is truly difficult, and often they feel this need to keep moving. INTJs want to be able to take their time with analyzing and uncovering the right information, but that doesn’t mean they have really slowed down as much as it might seem. Even if the INTJ seems to be still, their minds are running through so many thoughts and pieces of information. INTJs do prefer to keep themselves moving and always growing, and so sincerely slowing down can be a bit challenging for them at times. ENTJs don’t like truly slowing down and often they find themselves wanting to keep pushing forward. They believe in being as efficient as possible and also work hard to keep themselves growing and advancing. Because of this desire to keep moving forward, ENTJs don’t really like to slow down. They are often somewhat high strungs people and for them taking a step back and just trying to calm their pace, is truly difficult. INTPs often appear like they can slow down, since on the outside they might look calm. This is a rather misleading thing about the INTP personality, since they rarely slow down inside of their minds. Even when the INTP appears to be more stagnant, they have so many things going on inside of their thoughts. They run through different patterns and information, always having new ideas bouncing around. This makes it almost impossible for the INTP to sincerely slow down, even when they seem to have stopped completely. ENTPs are often rather active people, incapable of slowing down even when they are physically calm. ENTPs have so many new ideas and thoughts constantly buzzing around inside of their minds. For the ENTP truly slowing down can be almost impossible, since they find it hard to calm or slow their active and sometimes chaotic inner minds. They constantly find themselves processing different things and wanting to explore their imaginations, making it hard to be all that calm inside. ISTJs are often active people who constantly want to work to get things done. They believe in being efficient and working hard to get the job done. While ISTJs do find themselves constantly moving around and working to finish things the best they can, this doesn’t mean they cannot slow down sometimes. ISTJs also enjoy having some downtime in between working hard, knowing that they have earned this time means a lot to the. ESTJs are often very focused and driven people who believe in being efficient in everything they do. That fact that they are such active people can make it difficult for them to slow down. They can be a bit high strung, especially when they are focusing on getting something done to the best of their abilities. While ESTJs do have a tendency to be rather active, this doesn’t mean they are incapable of slowing down when they need to take a break and relax a bit. ISFJs enjoy being able to get things done and often have a lot they juggle at once. While ISFJs know how to keep themselves moving and working towards getting the job done, this doesn’t mean they cannot slow down sometimes. When they need to take some time with their loved ones just relaxing, this is actually something the ISFJ enjoys. They do put a lot of pressure on themselves though, and these rare moments only happen when they feel like they have earned it. ESFJs do sometimes struggle to slow down, especially when they feel like they have so much to get done. Since they care about impressing and taking care of their loved ones, they want to be sure they don’t let anything fall behind. This desire to be there for the ones they love and make sure they are someone others can be proud of, causes the ESFJ to be a bit high strung sometimes. They might take on too many things, and not really know when they need to slow down and relax a bit. ISTPs don’t really like feeling stagnant and often want to keep themselves moving in different directions. ISTPs live very much in the present and enjoy being able to explore new things. While they don’t enjoy stagnant and want to be able to jump into something thrilling, that doesn’t mean they cannot slow down sometimes. If the ISTP is more inspired by taking a step back and just relaxing, then they are certainly capable of slowing down. ESTPs can sometimes be a bit chaotic and don’t always know how to calm themselves. ESTPs don’t like sitting still and can become a bit antsy if they are forced into stagnancy. They enjoy exploring different things and want to feel open to bouncing around without feeling stuck in the same choice or situation. For the ESTP slowing down really isn’t easy, and even when they feel like relaxing this often includes doing something which most would find a bit spontaneous and even adventurous. ISFPs are capable of slowing down more than people often realize about them. They might like living in the present, but to the ISFP this means absorbing their surroundings. They want to live in the moment by enjoying what is going on around them, sometimes just taking their time in nature. ISFPs definitely know how to slow down, since for them it is best to enjoy what is around them than to become obsessed over the future. ESFPs are often adventurous people who want to be able to enjoy living in the present moment. They don’t like feeling restrained or trapped, and want to feel free to break free and go somewhere new. For the ESFP slowing down can be challenging, since stagnant for even a moment can be exhausting for them. ESFPs want to be able to change their minds and constantly having something to keep them active and entertained.